It has been often said, even by dispassionate observers, that our economic policies built on ideological considerations and economic assumptions are far removed from the realities of our situation. For more than three decades, we have been striving to design an economic policy and a planning procedure that are distinctly Indian, but the effort has often resulted in only mixing and merging borro- wed ideas and experiences. However, whatever may have been the ideological elements influencing the thinking on economic policies in the formative period of the pre-independence days, the situation has changed considerably in the actual formation of economic policies since Independence, and the effort has been not to be too closely identified with any ideology, but to work out a policy that will draw upon all these ideological positions. To what extent we have succeeded, required a detailed examination. Accordingly, I brought out, a few years ago, a treatise on 'India's Economic Policies' which continues to be extremely popular, with the inteIlec- tual elite, the world over. 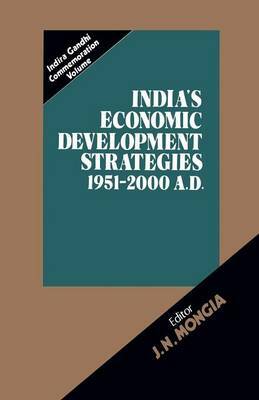 In this, the learned contributors, dwelt at length on the different aspects of India's Economic Policies from 1947-77, and brought out the strength and weaknesses of the Indian economic scene. The present work on 'India's Economic Development Strategies' is born out of the conviction that what India needs now is a set of strategies, which are a consistent set of policies, and that there is an urgent need for the same in Indian Planning.